A Plate Of Rice, 1 Shami Kebab, Tomato Garlic Chutney And Traditional Raita. A Plate Of Rice, 1 Chicken Piece (1/8 Size), Kachumar Salad And Traditional Raita. A Plate Of Rice, 2 Mutton Pieces, Tomato Garlic Chutney And Traditional Raita. A Full Plate Of Rice, 4 Mutton Pieces, Tomato Garlic Chutney And Traditional Raita. 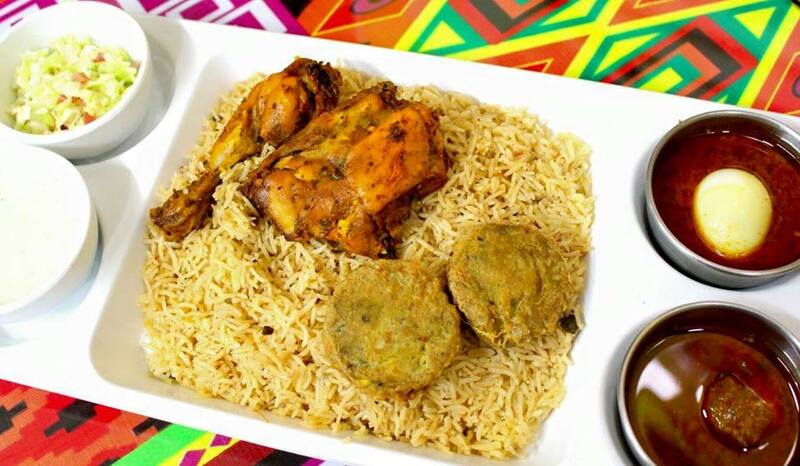 A Plate Of Rice, 2 Chicken Pieces (1/8 Size), Kachumar Salad And Traditional Raita. 1 Quarter Chicken Piece, Fresh Fries, Tomato Garlic Chutney And Traditional Raita. 1 Haf Chicken Piece, Fresh Fries, Tomato Garlic Chutney And Traditional Raita. 1 Quarter Chicken Chargha, Fresh Fries, Tomato Garlic Chutney And Traditional Raita. A Plate Of Rice Prepared In Desi Ghee, Half Chicken Piece, Yakhni And Tomato Garlic Chutney. A Full Plate Of Rice Prepared In Desi Ghee, Full Chicken Chargha Yakhni And Garlic Chutney. A Plate Of Rice Prepared In Desi Ghee,1 Big Mutton Piece, Yakhni And Tomato Garlic Chutney. written by Sam Mohammed on March 6, 2019, 2:26 p.m.
Pakistani cuisine is great to have because of the variety of handis, karahis and barbecue items you can have. There is really so much on a Pakistani cuisine menu that you will find something for everyone. Now Pulao House in Lahore is a great place for Pakistani khaaba. They’ve got a range of handis such as chicken handi, Mughlai handi, chicken cheese handi, chicken makhni handi, mutton nawabi handi and much more. If you want karahi, look no further either. Pulao House has got delicious chicken tikka karahi, mutton karahi, mutton Balti gosht and chicken malai karahi. And don’t forget to try their barbecue. Whether it’s chicken tikka, beef behari kebab or chicken reshmi kebab that you desire- they’ve got it all. But you know what they’re really famous for? It’s their delicious and savoury chicken pulao with a side of shami kebab, or their chicken Bombay biryani or their chicken steam roast. That’s what the real deal is. Because who doesn’t love a place of hot and spicy chicken biryani or chicken pulao with a side of shami kebab, raita and salad to complete it all? Don’t just drool over the food- order now through cheetay! Cheetay has got the best delivery rates and service in Lahore. Cheetay riders deliver all over Lahore from all over Lahore. So just because you’re craving chicken pulao from Pulao House in Lahore but are at the other end of the city, you don’t need to bypass on that. Order through cheetay and have your food served warm to you. And ordering through the cheetay app is even easier. Tell us, kya chahiye?